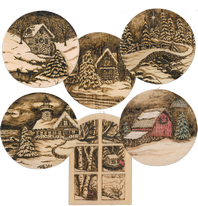 Set of 6 Woodburned Holiday Ornament patterns. Includes patterns and finished piece photos to create house with chimney bridge mill barn lighthouse and bird feeder. Four inch diameter round blanks (Item 5611) and 3 x 4-1/2 inch blanks were used to create these. See item 5420 if you would like the blanks included with the patterns.